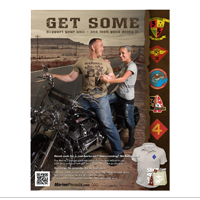 In this issue, we honor one Marine who gave his life in service to his country, and highlight another who waited through months of deployment to meet his brand new baby daughter. This issue contains news about a new Distinguished Warfare Medal, which has been introduced by the Department of Defense to recognize contributions to battlefield operations undertaken from thousands of miles away. We also present a new research study undertaken by the Defense and Veterans Brain Injury Center (DVBIC). 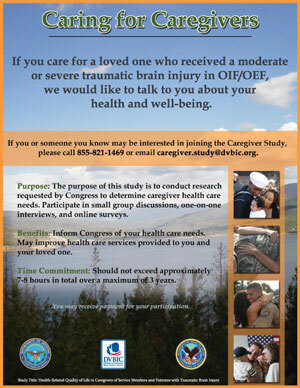 If you are a caregiver for a service member with moderate to severe TBI, we encourage you to take part. Additionally, you can go to www.purplehearthero.com/caregivers to find people who are sharing your experiences. Team Marine Parents has completed the steps required to be a charity partner with the Marine Corps Marathon this October, so if you know any marathoners, let them know that there is a place for them on our team! But the team is not just for marathoners, as we show in this issue. Finally, we highlight an area of southern California where Marines and surfers have alternate uses for the same beachfront property. Sergeant William Stacey, a squad leader who served with 2nd Battalion, 4th Marine Regiment, was killed in action in Helmand province, Afghanistan on Jan. 31, 2012. On February 15th, 2013, Sgt. Stacey was posthumously awarded the Bronze Star Medal with Combat Distinguishing Device for valor for his actions throughout his deployment. Earlier this month, Defense Secretary Leon Panetta approved the creation of a new Distinguished Warfare Medal. The medal is designed to recognize actions that have had a major impact on battlefield operations, yet were performed remotely by servicemen and women located thousands of miles from actual combat. In the past decade, technology has dramatically changed the methods of modern warfare, and the actions of a drone operator in Nevada or a computer programmer in Virginia can have lifesaving effects half a world away. Although designed to recognize the importance of these nontraditional battlefield roles, the award has become controversial due to its order of precedence among other medals, and three representatives on Tuesday introduced a bill to reduce the ranking of the award. has three sons. He had always been present for the births of his children, but when his daughter was born, he was thousands of miles away in Afghanistan. Many Americans are familiar with the old Beach Boys tune "Surfin' USA". 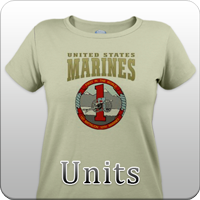 Do you think you could pass the USMC IST? Would you like to be able to? Join Team Marine Parents, and join others who have committed themselves to sharing what they can of the experiences of their Marine. If you have a watch, and your local high school has a track and a pull up bar, you have everything you need to measure your progress. How long does it take you to go six times around the track now? Can you get around once in two minutes, or three? The banner photo is a Marine Corps photo taken at sea 02/05/2013 by 2nd Lt. Matthew W. Finnerty. Marines and sailors from the 15th Marine Expeditionary Unit and Peleliu Amphibious Ready Group conduct a visit, board, search and seizure exercise aboard the USS Winston Churchill (DDG 81) as part of Exercise Leading Edge 13, Feb. 5. The exercise is a multinational and interagency supported exercise designed to develop and refine weapons integration capabilities among partnering nations including suspect maritime material inspections, seizure and disposition. The 15th MEU is deployed as part of the Peleliu Amphibious Ready Group as a U.S. Central Command theater reserve force, providing support for maritime security operations and theater security cooperation efforts in the U.S. 5th Fleet area of responsibility. The Bronze Star ceremony photo was taken Feb. 15, 2013 by Lance Cpl. James Gulliver. Anna Stacey, sister of Sgt. 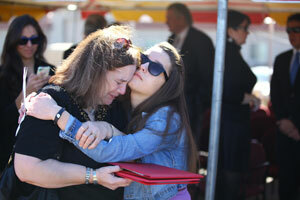 William Stacey, holds her mother Robin Stacey in an embrace during a ceremony at the 5th Marine Regiment parade field here Feb. 15, 2013. Sergeant Stacey, a squad leader who served with 2nd Battalion, 4th Marine Regiment, was posthumously awarded the Bronze Star Medal with Combat Distinguishing Device for valor for his many acts of perseverance and courage during his deployment to Afghanistan in late 2011. In a letter written to his family just before he was killed in action in Helmand province, Afghanistan, Jan. 31, 2012, Sgt. Stacey said he was willing to give his life for the good of the people of Afghanistan and for his Marines. 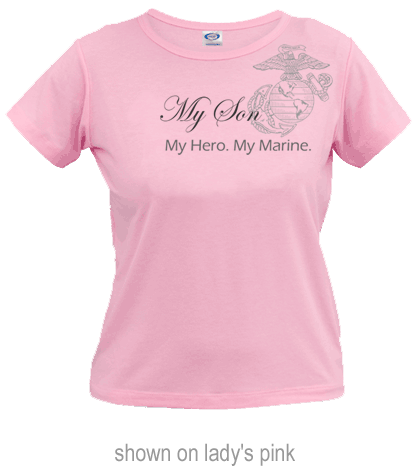 The photo accompanying "Marine meets daughter" is provided courtesy of the USMC. Staff Sgt. 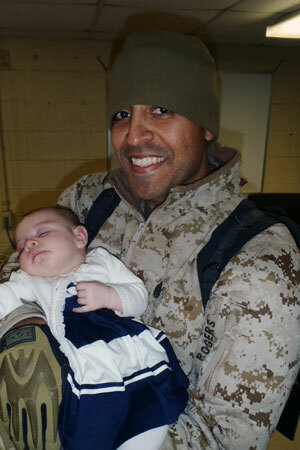 Luis A. Rogers, a Sunrise, Fla., native and utilities chief with Combat Logistics Battalion 2, 2nd Marine Logistics Group, holds his daughter, Emmali Grace, for the first time shortly after returning to Camp Lejeune, N.C., Feb. 1, 2013. Emmali Grace was born Nov. 2, 2012, while Luis was deployed to Afghanistan supporting logistical operations. The photo accompanying "Marines vs. Surfers" was taken by Sgt. Christopher O'Quin on 2/13/2013. 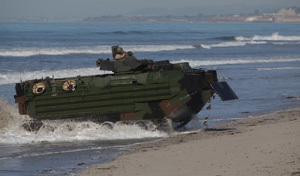 Marines with Amphibious Assault Vehicle Platoon, Bravo Company, 1st Battalion, 4th Marine Regiment, 13th Marine Expeditionary Unit, land their amphibious assault vehicle 7 as part of the final wave, during amphibious operations as part of Exercise Iron Fist 2013, aboard Marine Corps Base Camp Pendleton, Feb. 13, 2013. During Exercise Iron Fist, the 13th MEU and members of Japan Ground Self Defense Force spent three weeks participating in bilateral training which improved their interoperability, enhanced military-to-military relations, and sharpened skills essential to crisis response.